Pneumonia as a result of Influenza caught in France. Last week we reported on the death of Capt Maurice Mortimer Rooke which took place at the residence of his parents, Th Ivy, on the 8th inst. Capt Rooke who was 28, at the out break of war joined the Royal Wilts Yeomanry and was attached to the Wiltshire Regiment. He was promoted Captain in June 1916 and during the past 2 years had taken part in all the engagements that his regiment worthily upheld it’s tradition and was mentioned in despatches. He contracted Spanish influenza whilst in France but got better. He obtained leave of absence and came home, where he arrived on September 30th. He was unfortunately seized with the old complaint and developed pneumonia, this proved fatal. The funeral took place on Saturday (12th October). 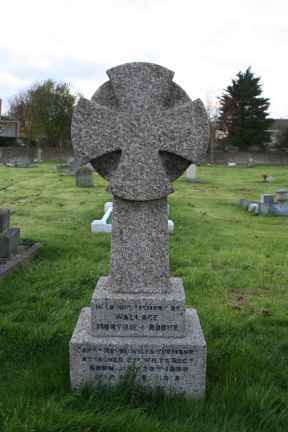 Military honours were accorded and a firing party under the command of Sgt Maj May fired three volleys over the grave. The band of the Wiltshire Regiment led the cortege. The coffin of polished oak was draped with the Union Jack on which the sword, belt, cap and spurs of the deceased were placed. Mr and Mrs Mortimer Rooke of The Ivy, who recently lost their son Capt Maurice Rooke have suffered two further bereavements. On October 14th, their youngest daughter Doris Mary Fredericka, aged 17 died through pneumonia following Spanish influenza and two days later E Marjory aged 20 died from meningitis following Spanish influenza. From the transport section, 2nd Battalion Wiltshire Regiment. 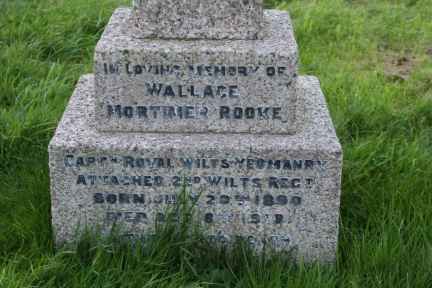 Wallace Mortimer Rooke Born 20 July 1890, died 8 October 1918.